Egyptian President Hosni Mubarak in an address broadcast on state television Jan. 28 said that he has dissolved the government and will form a new government Jan. 29. In other words, Mubarak is not stepping down. Changing the political face of the government is unlikely to pacify Egyptian protesters. Mubarak is undoubtedly the primary target of the demonstrations. The crisis in Egypt is thus far from over. The military still appears to be the main power broker in the country, and Mubarak’s fate is likely in the hands of his generals. Mubarak’s appeal to stay and the hours-long delay in making this speech could be a negotiated step between the two sides, but the potential for more direct and overt military intervention remains extremely high. Chief of Staff of the Armed Forces Lt. Gen. Sami Annan is expected to return to Cairo by Jan. 29 and next steps by the military are likely to be discussed then. The announcement was strategically made in the middle of the night in Egypt to give time for troops to take position. The military’s interaction with the demonstrators will need to be watched closely. So far, the military has been able to move into the cities and has been welcomed by the protesters without employing the more heavy-handed tactics of the internal security forces. What order they imposed came not from violence but from the perception that they would enable the demonstrators to bring down Mubarak. Apples for a post-briefing snack? Friday coverage in progress from Al Jazeera in this live stream. No hint yet exactly what it is, but President Obama plans to pitch gun control to the nation. Selective leaks have begun to appear in sympathetic, carefully chosen media. “There is going to be a special presidential address on gun control. It has not been scheduled yet, but there is going to be one in the near future. Yes, you can take it from me." "The White House said that to avoid being accused of capitalizing on the Arizona shootings for political gain, Obama will address the gun issue in a separate speech, likely early next month. He's also expected to use Arizona has a starting point, but make the case that America's gun laws have been too loose for much longer than just a few weeks." What will be proposed hasn't been leaked yet. Odds are it will include a proposal to ban high-capacity ammunition magazines. Rep. Carolyn McCarthy (D-NY) has already presented a bill in the House to do so. McCarthy's bill is now known as H.R. 308, the Large Capacity Ammunition Feeding Device Act. Assessments of Mr. Obama's gun control record and comments prior to the 2008 election my also provide insight of what he may propose. Now's a good time to go back and review pre-election analysis of Mr. Obama's record and comments on the subject. With the House of Representatives now under the control of a Republican majority, there's little chance of a health care style cram-through of a gun control package. "We believe the right to own firearms is subject to reasonable regulation, but we know that what works in Chicago may not work in Cheyenne. We can work together to enact and enforce commonsense laws and improvements - like closing the gun show loophole, improving the background check system, and reinstating the assault weapons ban..."
Then again, Mr. Obama and his team may not wait on either Congress or the next election. They may attempt to go the regulatory route, allowing agencies like the Bureau of Alcohol, Tobacco and Firearms to impose piecemeal restrictions beyond what's been done on the regulatory level in the past. 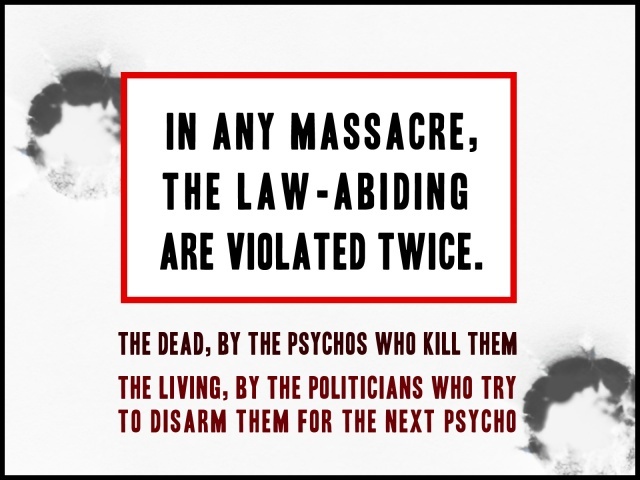 Or the Obama gun control plan may combine these different strategies. For now, the administration is releasing trial balloons, easing into the issue. But clearly, something is in the works. We should have a better grasp of what's afoot in the next couple weeks. Win the Future. Obama's new slogan. Gotta ask: What White House (or campaign) genius came up with a slogan that, when shortened, comes out to be WTF? What the... is up with that? Sarah Palin scores with publicly saying what others have snickered about in private. In the Fox News interview, Palin goes on to talk seriously about the need to cut the federal debt, the Tea Party influence, and "healthy debate" within the Republican Party. But in this age of soundbites, it's the WTF quip that will have people talking. The Interior Department proposes rules that could kill thousands of coal related jobs. Former White House advisor Van Jones says disposable plastic triggers social injustice. More than 700 companies and unions now qualify for Obamacare waivers. We're told Obamacare won't hold down costs. And you may not get to keep your plan. Is it just my imagination, or does this stuff read like it's ripped from the pages of Atlas Shrugged? A controversial image makes the cover of Newsweek. View it here: "American Assassins"
"The brilliance of our Constitution and the political system it shaped has always rested uneasily beside a troubling tradition of lethal violence. This nation was born in armed revolution, an idea not lost of (Tucson suspect Jared) Loughner or most of the other assassins of the past." Do you buy Newsweek's attempt at a connection? Or is the image of a flag-draped assassin on the cover of Newsweek designed to suggest political violence can be linked to flag-wavers? Flag-wavers at a Tea Party rally perhaps? Then again, maybe the cover was merely an attempt to attract attention at supermarket point-of-purchase displays. (Gotta admit, the spooky flag-draped gunman got my attention). 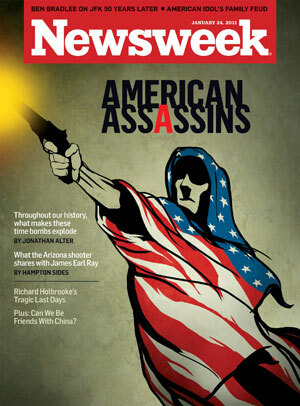 Newsweek does seem to twist a lot of history if it wants to wrap assassins in the flag. Some of America's most notorious assassins may have at times had political bents, but most didn't envisioned themselves to be what we'd call patriotic Americans. Nor did they portray themselves as such before or after. Abe Lincoln was shot by a Confederate sympathizer. William McKinley by an anarchist. JFK's sniper was a fan of communism. Bobby Kennedy's killer spouted anti-Zionist rhetoric. Two apparent attempts on Gerald Ford's life came from members of the Manson family. And Ronald Reagan's unsuccessful assassin was a sicko trying to impress Jodie Foster. Best I can tell, only President James Garfield was shot by a Republican gadfly. History tells us Garfield assassin Charles Giteau took matters into his own hands believing he was slighted when he failed to get a post-election political appointment. But there's also plenty of evidence Giteau was not a right thinking man. Even Newsweek admits the real common thread connecting most American assassins appears to be mental illness. So why wrap the cover figure in a flag? One more thing about Newsweek's flag-draped assassin: The suspect in Tucson didn't wrap himself in a flag. A video posted on-line is purported to show him burning one. Rep. Michele Bachmann (R-MN) scores with Tea Party talking points, but I think Ryan better articulated the crisis of the federal debt. And Ryan rightly stated both political parties are responsible for the mess we're in. A quick recap of President Obama's State of the Union: A largely forgettable address where the prez tries to salvage his agenda by labeling it differently. But if you cut through the lexicon tweaks, it was still a sermon extolling the virtues of big government and government dependency for large segments of the population. I guess he used up his pep in Tucson. 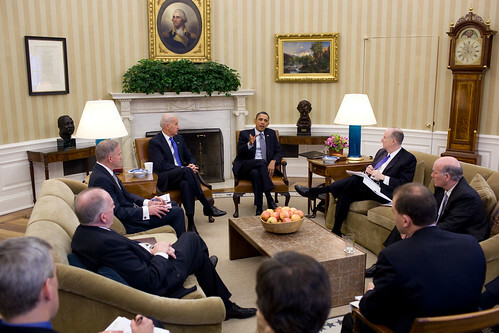 Obama's plan still seems pegged to spending our way our of recession. Far too little emphasis on deficit reduction. Still living in denial. Still kickin' the can down the road. While it's reported Chinese bloggers continue their jabs over American humiliation, America's mainstream media has come to the defense of pianist Lang Lang for his performance of a Cold War era Communist anthem at the White House. The song "My Motherland" was written as the theme for a film depicting a battle in the Korean War where Chinese troops defeated Americans. We blogged about the context previously. But now the Washington Post apparently defends the selection, saying other "patriotic" songs can be "offensive" as well. The Post includes the Star Spangled Banner in its short list of three. "You know, I never know about that movie. I just learned it afterward. It's like, 1956. This is when my mother was two years old. I mean, this was 55 years ago. And when I grew up, I only hear this as a beautiful melody." Really? How many serious artists fail to understand the history of works they present? Would we excuse a performance of "Tara's Theme" in a racially-charged setting if the artist claimed he didn't know the context of "Gone with the Wind" and that it included slavery? Over at Human Events, John Hayward takes it a step further, saying "My Motherland" at the White House would be like "providing music from Rambo II on a state visit to Vietnam." And, as for the Post's assertion there are other "offensive" songs out there. For sure, patriotic tunes have often had their birth in the heat of battle. But the Post's examples fail to factor the toning nature of time. And the Post fails to note there are living vets of the Korean era, and living relatives of those killed on Shangganling Mountain. Isn't it odd the voices of U.S. political correctness haven't spoken up on their behalf of those vets and families? Meanwhile, Lang Lang continues to defend himself with posts and re-posts on Facebook. And the White House tells ABC News there was no insult. But, at the very least, the White House showed extremely poor judgment in failing to fully vet entertainment at last week's function. Perhaps for the next state dinner, the White House should pick its entertainment as carefully as it chooses its wines. Despite preview reports promising a "quintessentially American" theme for the evening, the White House failed to deliver. An anthem composed in celebration of Communist aggression on the Korean peninsula really missed the mark. "The real reason you have inflation is the governments are inflating." CNBC offers a discussion of "off the grid economic indicators" that includes talk about the surge in demand for silver coins. If you prefer inflationary soothsaying in song, folk singer Elaine Diane Taylor offers the haunting "Helicopter Ben" over on YouTube. People, the Chinese are laughing at us. Last week's White House dinner honoring President Hu had a decidedly anti-American moment. But it went right over our heads. "Those American folks very much enjoyed it and were totally infatuated with the melody!!! The U.S. is truly stupid! !” wrote a user named You’re In My Memory on Sina’s micro-blogging site." The WSJ notes that particular post was reposted many times. You see, the song was featured in "The Battle for Triangle Hill" (also known as "The Battle on Shangganling Mountain"), a well known anti-American film depicting scenes from the Korean War. It's a film where the Red Army is seen delivering a crushing blow to "imperialist" troops of the American army. Images of panicked, confused Americans being machine-gunned by the Red Army. These are the kind of images many Chinese minds likely linked to the song they heard played last week. For another account of Chinese reaction, a story from The Epoch Times can be viewed here. The whole affair leaves me grasping for words. Seeking some kind of explanation. Did our president or his staff have the slightest clue they set the stage and allowed our country to be humiliated as they sipped wine and celebrated the rise of China? Does the White House not vet its official entertainment? It was bad enough when we saw the image of Chairman Mao hanging from a White House Christmas tree a while back. But to have the White House serve as stage for a blatant pro-Communist, anti-American anthem? We all deserve a presidential apology. Especially our vets who fought in Korea, and those who have served there since trying to keep the peace. Open phones, open topics. A time where you can bring us your thoughts on the news of the week, or any other issue you want to bring up. The goal would be to provide a live outlet when most talk radio outlets have gone into replay. The likely time would be just after midnight (EST) on Friday or Saturday night and, based on reception, expandable to a second night. For now, it's just an idea being tossed around. Please help me with some feedback or suggestions either by comment (below) or by email. And please check out the TalkSouthRadio.com site if you haven't already. A bunch of freshman reps in Congress sleep in their offices. Saves money, puts 'em on the job 24/7. A good idea? Law blog says the new rules will be announced Monday. Begs the question: Will the Obama administration attempt to revive portions of the now expired "assault weapons ban" by regulation as opposed to legislation? During one of the robberies, the robber stated: “I just want my TARP money back” and, at one point during another robbery, he apologized to customers, indicating that he wanted the bank’s money. Daily Kos comes on like gangbusters. It claims to have found evidence Glenn Beck inspires politically motivated violence. Daily Kos has worked to spin this into something bigger, but why has it waited until now? The Beck-bashers watch his show daily. And, especially since the Color of Change adverstising boycott began in August 2009, have dutifully reported what they consider to be examples of Beck's inflammatory rhetoric. So now, suddenly, they "discover" a clip from June 2010? Ryan Witt at Examiner.com takes on the Kos spin. Witt does so by providing additional context. But even Witt may have missed the mark in concluding "Beck's quote seems to violate his own claim that he consistently advocates for non-violence." In reality, Beck seems to be warning against forming political alliances with those who advocate or have advocated revolution, sometimes violent revolution, in the past. His point appears to be attempts to co-opt radicals may simply play into the hands of radicals seeking a foothold on power. Beck warns hard-liners can't be co-opted, that those of more moderate views who try to co-opt radicals for expedient political gain may at some point have those radicals turn on them. Beck's warning is broad. His focus may be on Democrats, but the principle applies to Republicans and Tea Parties as well. That's why this "violent" rhetoric was overlooked last June. The intent of Beck's monologue appears to be opposite of the Daily Kos spin. It's a call to disassociate from violent elements. Gotta ask, what's the agenda behind Daily Kos and others who take Beck out of context? Is it simply to smear? Or do they seek to incite and escalate political tension to benefit an agenda? And why are many "progressives" quick to spread Daily Kos spin prior to checking context for themselves? Perhaps because these spreaders have fallen into a herd mentality, and no longer subscribe to the concept of personal "due diligence" when it comes to politics or association. Check the facts. Dig for context. Connect the dots. Choose your friends, and who you follow, wisely. Don't allow yourselves to be led like sheep, or herded like cattle. Back in April 2006, students at Columbia Business School put together a music video spoofing their dean and marking Ben Bernanke's rise to chair the Federal Reserve Bank. I found it hilarious in '06. It's kind of eerie now. Georgia has endured a rush of bank failures in the past few years. For much of the time, Georgia has led the nation in the number of banks closed. I haven't crunched numbers lately to see if we're still "number one." Suffice it to say, we've had a lot. A civil lawsuit filed by the FDIC last week gives insight into what the agency says led to one of those failures. And the circumstances laid out in the filing seem to involve a principle with ramifications well beyond banking. "State and federal regulators repeatedly warned the Defendants of the increasing risks associated with the banks's excessive growth rate, heavily concentrated loan portfolio and lax oversight and control of the lending function. The Denfendants had actual notice of these risks and a growing awareness of adverse changes in the real estate market but made little or no effort to diversify the bank's portfolio..."
The suit goes on to allege defendants "continued to choose short-term profits over prudent lending, including by approving the Loss Loans, betting that demand for real estate in the Bank's chosen markets would continue indefinitely." The FDIC charges these bank officials knowingly pursued an unsustainable growth strategy, and failed to take steps toward a more sustainable footing. The FDIC is now suing to recover about $70 million it says was lost as a result. Sustainability is a concept many in business and government no longer seem to comprehend. The case of Integrity Bank appears to be an example. But the impact of unsustainability extends well beyond banking. Sustainability requires a long term view, anticipating bad times as well as good. Many government budgets are crafted with the same unsustainable recklessness alleged in the Integrity Bank suit. In the bubble years, many local governments assumed real estate prices, and the resulting property tax revenue, would continue to climb forever. Now these governments must scale back, and learn to live within their means, often while paying for excesses they inflicted upon themselves during fat times. For government entities funded by property tax, this means operating on revenue based on a tax digests that are significantly smaller than they were a few years ago. For some, there's temptation to slow or forgo a rollback in assessments. We must hold these governments accountable. If you own real estate, check your tax assessment. Make sure your property is not taxed beyond its present market value. If your assessment is too high, challenge it. Another temptation for many governments will be to simply raise tax rates. But it is our role as citizens to challenge the assumption that the answer lies in boosting taxes. Higher property taxes may be the final nudge that puts some struggling owners over the line, triggering foreclosure. This is especially tempting for those already underwater with their mortgages. Higher property taxes deter potential home buyers, especially if a nearby community offers an alternative at a lower tax rate. Higher taxes also deter expansion or other investment by business in community. As citizens, we need to apply pressure on our local officials the same way the FDIC says attempts were made to pressure Intregrity Bank to mend its ways. We should encourage only prudent spending, and cuts where possible. We have to remind, and in some cases educate, our leaders on the issue of sustainability. The FDIC stands ready to bail out depositors when a bank fails. A healthy bank is usually found to acquire a failed one, and business continues as normal for the consumer. There is no similar prearranged agency or mechanism for a smooth transition and overnight bailout if our cities or counties run an unsustainable course to the point of failure. The principle of sustainability applies to the federal government too. The federal debt is now over $14 trillion, and racks up billions more each day. Do the decision makers in DC really believe that's sustainable? It's time to communicate concern to your congressman and senators. 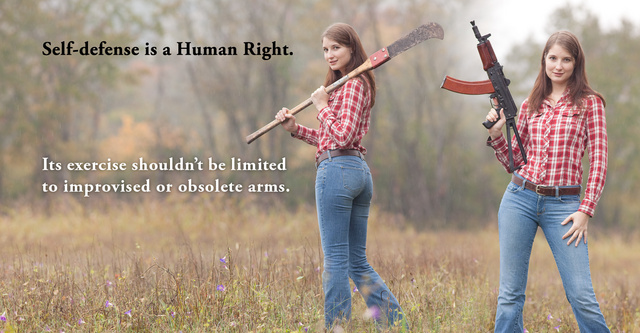 Carolyn McCarthyism : The campaign to rid law abiding citizens of access to hi-cap ammo mags. That. And anything else that comes up. Your calls are welcome at 678-344-9926. Join us. 8:00 pm EST. 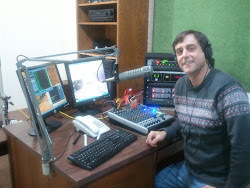 Listen at TalkSouthRadio.com or simply click here to access streaming audio. More political imagery to "incite"
(Warning: Recovering cannibals should avoid the following links). If you prefer to view directly from the Democrat's site, just click here. How many unstable potential cannibals will view this "inciteful" image? The cover story of this week's Bloomberg Businessweek pushes for a ban on high capacity ammunition magazines. "The rise of the Glock and other semiautomatic handguns cannot be linked to variations in overall crime rates. But that doesn't mean it would be pointless to take small steps to reduce mayhem, such as restricting magazine capacity." I think they just said there's no evidence to support enacting further gun control or a ban on hi-cap mags. But they encourage us to go with the emotion of the moment so we'll all "feel" safer. Sorry guys, I'm not buying it. The proposed bill, by Rep. Carolyn McCarthy (D-NY), is more restrictive than magazine limits in the now expired 1994 "assault weapons" ban. In a letter last week, McCarthy said she plans to introduce her legislation on Tuesday, January 18th. McCarthy's bill and the push to enact it will be among topics Don and I tackle Tuesday night on TalkSouthRadio.com. We invite your call-in participation at 8:00 pm EST at 678-344-9926. Maybe a cartoon will help people realize how silly it all sounds. Royal Marshall was producer of the Neal Boortz Show, and for a time has his own show on WSB. We are saddened and shocked by this sudden, unexpected loss. We express our condolences to his family, friends and co-workers. The Mexican government says over 15,000 people died there last year from increasingly violent drug cartels. Some in the U.S. government have charged firearms smuggled from our border states into Mexico are a prime factor in the escalating blood shed. But as rhetoric targeting U.S. gun sellers ratchets up, the government may be downplaying the role of non-U.S. arms suppliers as it sells us on the gun store angle. And questions are being raised about the practices of U.S. agents empowered to police firearms trafficking. Let's try to connect some dots as we know them. Admittedly, more dots are needed to provide a clear image of what's going on when it comes to arms, smuggling, and Mexican cartels. David Codrea at Gun Rights Examiner has a series of writings about what he now dubs "Project Gunwalker." The latest, entitled "Does Texas gun shop tie in with ‘Project Gunwalker’? , links to a Houston TV news story where a prominent Texas attorney alleges employees of a licensed firearms retailer were encouraged by the Bureau of Alcohol, Tobacco and Firearms to make gun sales to buyers even when buyers raised store employees' suspicions. The Fox 26 report was in response to a December story in the Washington Post. In its story tying U.S. guns to Mexican crime, the Post reported guns illegally smuggled from U.S. border states are a prime source of arms fueling Mexican violence. Undoubtably, some guns from the U.S. are making their way south. But officials who want us to believe small retail purchases of guns are the primary source of cartel armament tax our ability to reason. The same Washington Post that last month targeted Texas guns documented another source for cartel arms only five months earlier. In July, the Post reported large numbers of guns and grenades have gone missing from military arsenals in Central America. "An investigation by Guatemala's El Periódico newspaper found that as many as 27,000 military weapons, including an unknown number of grenades, may have been illegally sold or stolen in recent years." We are grassroots talk radio. We'll be back with another live show Tuesday, January 18th, at 8:00pm EST. Tonight, Don and I talk about federal debt. We'll talk about other stuff too. You can join tonight's conversation at 678-344-9926. Go to TalkSouthRadio.com and click on "Listen Live." Update: Moody's and S&P out with new warnings about the rising debt. The Wall Street Journal notes the warnings are greeted with shrugs. There are reasons we must strive to keep government as local as possible, and resist surrendering local control to the higher levels. We have far more say in the affairs of our communities if those governing know our names and recognize our faces. "But it is not by the consolidation, or concentration of powers, but by their distribution, that good government is effected. Were not this great country already divided into States, that division must be made, that each might do for itself what concerns itself directly, and what it can so much better do than a distant authority. Every State again is divided into counties, each to take care of what lies within its local bounds; each county again into townships or wards, to manage minuter details; and every ward into farms, to be governed each by its individual proprietor. Were we directed from Washington when to sow, and when to reap, we should soon want bread. It is by this partition of cares, descending in gradation from general to particular, that the mass of human affairs may be best managed, for the good and prosperity of all." The foresight of Mr. Jefferson is simply astounding. The wisdom of his statement is being rediscovered today both in the U.S. and abroad. Can the Fed go broke? "If interest rates rise by one percent..."
Remember last year when a couple of Rand Paul supporters noticed suspicious behavior? When police failed to take action - and a suspicious person rushed the candidate - the supporters took action. There was no gun. No real intent to do physical harm by the activist. But those subduing her had no way of knowing at the time. Some were quick to protest the "brutality" of the Rand Paul guys. It was also bystander intervention that subdued suspect Loughner. But only after his magazine was empty. Perhaps what happened in Tucson will make critics of last year's tackle see what happened then in a more favorable light. Are progressives acting on their bias in playing their Tucson blame game? Or do they simply see opportunity for political gain by attempting to reawaken fears in others? "They tell us, sir, that we are weak; unable to cope with so formidable an adversary as our debt. But when shall we be stronger? Will it be the next week, or the next year? Will it be when we are totally destitute, and when interest payments eat so large a part of our federal budget that we can no longer afford even the most basic expenditures? Shall we gather strength by irresolution and inaction? Shall we acquire the means of effectual resistance by lying supinely on our backs and hugging the delusive phantom of hope, until our debt shall have bound us hand and foot?" Events last weekend in Tucson have diverted attention from a lot of things. Concern over the national debt is among the subjects momentarily forgotten. Let's revive the discussion Thursday night, January 13, at 8:00 pm EST on TalkSouthRadio.com . We make no apologies for impassioned viewpoints. And we welcome yours. Saturday's horrific incident in Tucson appears to be the work of a mentally unstable individual. So many writings attempt to lay blame for Saturday's shooting with conservative media. But there are questions these blamers fail to include in their accusations. Did the man now charged with the shootings, Jared Loughner, get the mental health exam that was reportedly requested by his school? If so, what did it show? If not, why not? Did Loughner have a job? If not, who provided the money for him to acquire a pistol, ammo and at least one extended magazine? If someone provided the means to acquire the weapon, did this person know of the concerns raised by Loughner's school? "WOW! I'm glad i didn't kill myself. I'll see you on National T.v.! This is foreshadow .... why doesn't anyone talk to me?.." he posted on MySpace Dec. 14. On Dec. 13, he wrote: "I don't feel good: I'm ready to kill a police officer! I can say it." Have you ever heard of anyone who advocated the random killing of a police officer? If so, who? And were they aligned with any particular political cause?